Thick fillets of any firm, flaky, and mild-flavored fish, such as halibut, haddock, or striped bass, would work well here. Cut fish into 4 pieces and season with salt and pepper. On a work surface, arrange 3 slices bacon so they overlap slightly. 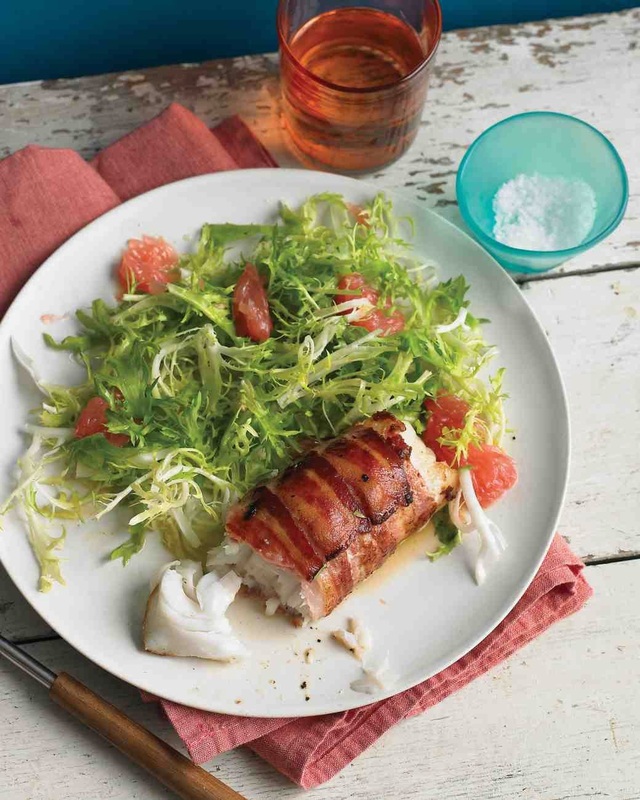 Place a piece of fish at one short end and tightly wrap with bacon, cutting off any excess bacon. Repeat with remaining fish and bacon. Whisk together mustard, honey, vinegar, and cup grapefruit juice; season with salt and pepper. Gradually whisk in oil. Heat a large nonstick pan over medium-high. Place fish, seam side down, in pan and cook until bacon is deep golden brown on all sides, about 9 minutes, turning occasionally. Toss frisee with dressing and grapefruit and serve with fish.